As a huge fan of islands, the only Greek island I have been to is Corfu, on the west side of the mainland, in the Ionian Sea. I've salivated over the likes of Santorini, Mykonos, and Paros, part of the Cyclades archipelago, but have yet to visit them. Author John Freely spells out the absolutely incredible history of these islands, which goes back thousands and thousands of years, and the gauntlet of being invaded and ruled by so many. He also talks about Greek Mythology and where Apollo and Artemis were born (Delos), where Zeus grew up, the real wars, and more recently, the increasing tourist industry of these islands. (I thought I would have to try again and again to wrap my mind around this history - Greek gods, churches, wars, mining, etc., but thankfully there's a chronological appendix I can use - besides, Freely hasn't belabored the historical aspect). John Freely began going to the island of Naxos in the 60s and continues to do so today. The rest of the book is about the individual islands' history; geography; legends; flora (much more diverse than you can imagine); their other names; patron saints; poetry written about them; celebrations; beaches; local produce; population; ferries; hotels, and so much more. 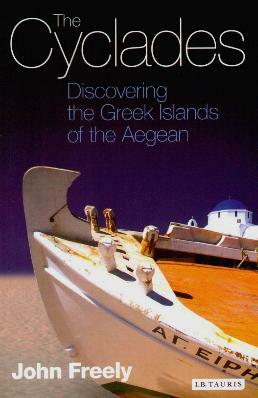 This is a great introduction to a little Greek Mythology, island history, and for deciding on a potential vacation destination. Conclusion - Extremely interesting. Photographs would have been nice.